"We're a long way from home, and we're going to have to start thinking differently if we're going to come to terms with space." 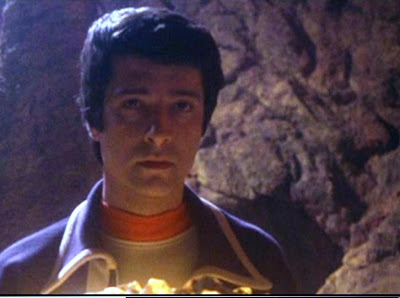 -Professor Victor Bergman, Space: 1999; "Matter of Life and Death." 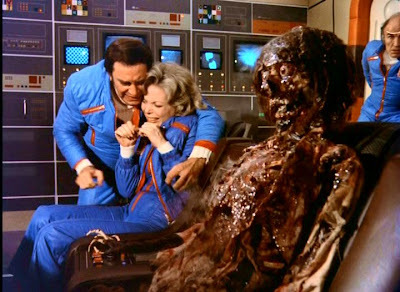 One important quality that differentiates Space: 1999 (1975-1977) from virtually any other outer space adventure ever created, even after thirty-five years, is its heavy accent on horror. Unlike Star Trek, wherein planets are joined peacefully across the ocean of space as part of a cosmic, political United Nations, Gerry and Sylvia Anderson's Space: 1999 presents the universe as a realm of incomprehensible and total, abject terror. Because the heroes of Space: 1999 (1975 -1977) -- the 311 astronauts and scientists stationed on Moonbase Alpha -- are psychologically and technologically unprepared for their unexpected journey into deepest space (it's the result of an accident on the moon's surface...) even the most wonderful or harmless mechanisms of the cosmos appear frightening, foreboding and unknown to these inexperienced, contemporary travelers. It's a metaphor, perhaps, for the way our cave-men ancestors may have regarded thunder, fire, the sun or the moon -- as inexplicable, fearsome elements of existence. Given this revolutionary and fascinating aspect of Space: 1999, I thought it might prove interesting today to make note of many of the horror myths, legends and concepts that Space: 1999 re-purposed during its two year, 48-episode run. Virtually all of these conceits, you will note, were given a technological sheen or update for the series, a polish well in keeping with an overarching theme that Science Digest's editor, Arielle Emmett termed "the downfall of 20th century technological man." 1. The Premature Burial: "Earthbound"
In the nineteenth century, one of the great human dreads involved being buried alive. This fear was so widespread, in fact, that some people saw to it that they had emergency signalling devices installed in their coffins upon internment. 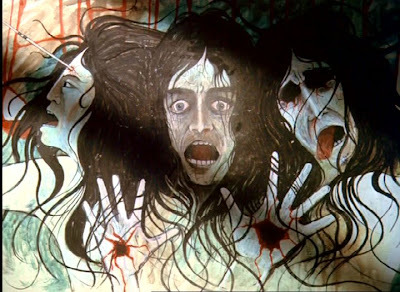 Gothic author Edgar Allen Poe exploited this societal fear of being buried alive in The Fall of The House of Usher and his 1844 short story, The Premature Burial. The horror trope of being buried alive has come to be associated with such concepts as claustrophobia (fear of being trapped in a coffin, in a confined space) and body paralysis, the inability to move or function within that confined space. The primary setting of premature burial fears, of course, is the casket: the narrow, tight final resting place of the human form. Modern films have also obsessed on the premature burial, namely Wes Craven's The Serpent and The Rainbow (1989) and The Vanishing (1993). In Space:1999, an episode entitled "Earthbound" by Anthony Terpiloff culminated with a high-tech, futuristic variation on the premature burial conceit. Earth's Commissioner Simmonds (Roy Dotrice) becomes entombed in a suspended animation device aboard an alien spaceship for a 75-year journey to Earth. A bully and an opportunist, Simmonds has resorted to extortion and black mail to get this coveted "slot" on Captain Zantor's (Christopher Lee) ship. He pays for his moral infraction, however, when -- just hours into the trip -- he awakens inside the transparent suspended animation chamber, the futuristic equivalent of a coffin..
Simmonds even has an emergency signalling device on his person, an Alphan communicator called a "commlock." He alerts Moonbase Alpha to his mortal plight, but the wandering moon is too far distant to come to his assistance. Simmonds is thus left behind -- alive and conscious -- in the claustrophobic container, without the possibility of help or rescue, a perfect metaphor for the terror inherent in the convention of the premature burial. 2. The Siren: "The Guardian of Piri"
Ancient Greek mythology gave the world the concept of Sirens: seductresses of the not-quite human variety who lured sailors to their isolated island with a tempting song, and then kept them trapped there for all eternity. The Sirens, uniquely, were temptresses of the mind or spirit, not the flesh, and boasted knowledge beyond the confines of linear time. Always depicted as females, the Sirens bore knowledge of both the past and future. In Homer's epic poem, The Odyssey, sea captain and warrior Odysseus -- on his long journey home -- had himself physically strapped to the mast of his vessel so he could experience the Siren song for himself. Let's just say it drove him to distraction. In Space: 1999's "The Guardian of Piri," written by Christopher Penfold, the wandering moon (also searching for "home,"much like Odysseus) falls under the tantalizing spell of "The Guardian" on an alien world. The Guardian, like the mythical sirens of the Greeks, extends its purview beyond the linear progression of time. In fostering "perfection" in its captive wards it can actually freeze time, holding living life-forms in a permanent stasis. Space:1999's Odysseus surrogate, Commander Koenig (Martin Landau), doesn't tie himself to the mast of Moonbase Alpha to resist the lure, but he is the only man on the installation able to resist the beguiling, female face of the Guardian, played by lovely Catherine Schell. Even Moonbase Alpha's oracle, Victor Bergman falls under the spell, describing, briefly, an "old man's fantasies." Finally, Computer itself is tempted by the Siren song and is "removed" to Piri. 3. The Midas Touch: "Force of Life"
In Greek mythology, there was also a man named King Midas of Phyrgia, a man who was gifted with the power to turn everything he touched to gold. This frightful power soon became a curse, however, when his food and water turned to gold, and even his beloved daughter was transformed into a gold statue. In the end, King Midas returned his power to the Earth, by spreading into a running river. After doing so, Midas left behind his love of the material world and material wealth. He came to despise the gold he had once coveted. Johnny Byrne's outstanding Space: 1999 episode "Force of Life" involves an Alphan technician, Anton Zoref (Ian McShane), who, because of an alien "gift," develops the terrifying ability to freeze objects and people on contact. The name Zoref is an anagram for FROZE, and Phyrgia even sounds a bit like Frigid. Likewise, when the tale climaxes, Zoref casts off his earthly life, becoming a power of pure energy. In his new form, Zoref, like Midas in a sense, leaves human concerns behind. 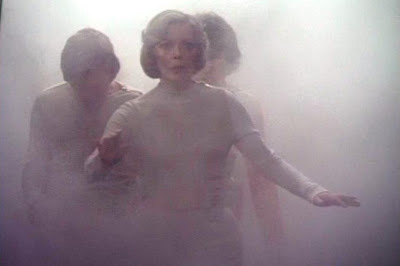 The Midas connection in "Force of Life" is perhaps more obscure than some of the other mythology in Space:1999 and story editor Johnny Byrne once described the episode as one in which a life-form "rises above human form." He told me. "The majesty of the creature (though unfortunate for Zoref) was that it was one step closer to attaining the next stage of existence." 4. The Midwich Cuckoos: "Alpha Child"
Our literary, cinematic and TV tradition is filled with examples of sinister, even demonic "changeling" children. John Wyndham's 1957 novel The Midwich Cuckoos (made as the 1960 film Village of the Damned) featured otherworldy but human-appearing children who pursued an evil alien agenda against mankind. The 1950s also gave the world sociopath Rhoda Penmark, The Bad Seed of novelist William March: a child without the empathy and innocence we associate with children. By the disco-decade of the 1970s, we were introduced to the demonically possessed Regan in The Exorcist (1973) and little Damien, The Anti-Christ, in The Omen (1976). Christopher Penfold's "Alpha Child" presents the tale of the first Alphan born in space, little Jackie Crawford, and the alien changeling (Jarak) who steals his place, possesses his body and accelerates his growth. 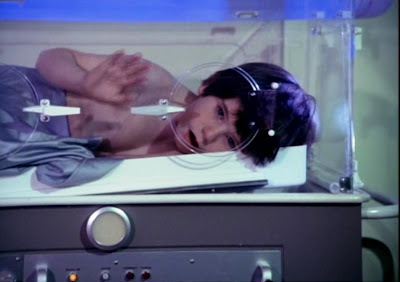 This terrifying episode is dominated by unforgettable horrific imagery, including that of a child psychically torturing his mother, and a grown child trapped within the too-small confines of a baby incubator. That last visual is a sign of "horror" overcoming technology, an important idea in Space:1999. 5. Dr. Jekyll and Mr. Hyde: "The Full Circle"
The dual, split-personality nature of the human being was observed and charted in Robert Louis Stevenson's 1886 novel, The Strange Case of Dr. Jekyll and Mr. Hyde. There, the crux of the story involved the separation of the "sinful" from "the moral" into two distinct beings, the savage Mr. Hyde and the civilized Dr. Jekyll. Space:1999 also dramatizes a variation of this story, in Jesse Lasky Jr., and Pat Silver's "The Full Circle." Here, the Alphans explore a planet called Retha and soon encounter a tribe of primitive stone-age cavemen. Later, it is learned that the Alphans themselves were the cave-men, having passed through a strange, misty time-warp and regressed to a less-advanced state. This time-warp is beautifully realized as a kind of waterfall of mist in a primeval jungle. Uniquely, this premise is explored in didactic terms: the Alphans have been separated not into sinful and moral versions of themselves like Jekyll/Hyde, but "primitive" and "technological" versions. And, ironically, it is the technological, modern model (personified by Alan Carter and Sandra Benes) who resort to physical violence. At the end of the story, a bewildered Koenig notes that there no aliens on the planet to contend with...just flawed human nature. "Because we couldn't speak to each other, couldn't communicate, we misunderstood," Koenig notes. "Yet it was only us there..."
6. Faust: "End of Eternity"
As early as the 1500s, Germany presented the legend of a learned mortal, Johann Fausten, or Dr. Faust, who was willing to trade his immortal soul for knowledge beyond human ken. His partner-in -trade was no one less than Satan, the Devil. A dissatisfied intellectual, Faust had an unquenchable thirst for knowledge and understanding, and went into the devil's bargain with his eyes wide open. Again, it's important: he was a man of science, a doctor. In Space: 1999's chilling "End of Eternity" by Johnny Byrne, the Alphans free a man called Balor (think Baal), from his own personal Hell: an inescapable asteroid prison cell. Balor,like Faust, is a scientist who has discovered the secret to eternal life; the spontaneous regeneration of human tissue. But, this alien devil with the secret of immortality demands a high price of the Alphans if they are to share in his information wealth: eternal submission to his sadistic, violent, Devilish ways. At least one Alphan, a grounded pilot named Baxter, makes a Faustian deal with this alien Lucifer. Koenig, however, refuses to cooperate and in a David & Goliath-like conclusion (that pre-dates Ridley Scott's Alien ) sends Balor hurtling out an airlock. 7. 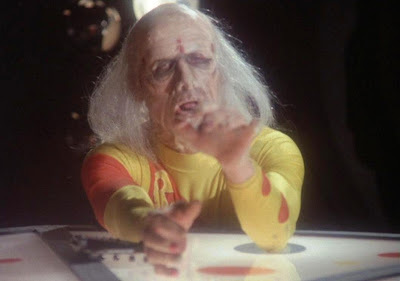 The Ghost: "The Troubled Spirit"
Space: 1999's Johnny Byrne here sought to "mix two things," and was stimulated by the idea of "combining horror and science fiction." "The Troubled Spirit" is an out-and-out, up-front horror story, one involving a ghost that haunts the spirit of a living man, technician Dan Mateo. In fact, the ghost is Dan Mateo himself...a spirit from the future haunting his present, mortal self. The Alphans, led by their oracle, Victor, must "exorcise" the murderous ghost, but in doing so, end up killing Dan Mateo and scarring him in the exact same fashion as his ghostly specter. "The Troubled Spirit" also showcases one of the most lyrical, brilliantly-staged opening sequences in all of television history, as a supernatural "wind" blows through the high-tech, white-on-white halls of Moonbase Alpha. Another example of the supernatural or horrific over-powering the auspices of technology and science. 8. St. George vs. The Dragon: "Dragon's Domain"
Saint George was a Christian martyr who saved a king's daughter from being killed by a plague-bearing, giant dragon. George committed this act, however, only after a guarantee that the king's land would soon be converted to Christianity. Christopher Penfold's outstanding Space: 1999 "Dragon's Domain" actually references the tale of St. George vs. The Dragon in its text. Here, the paradigm has been updated: it's astronaut Tony Cellini (Gianno Giarko) versus a tentacled cyclops which haunts a spaceship graveyard. Tony is not able to slay this dragon (that act is left to Koenig, armed with a hatchet), and Tony never forces a conversion to Christianity. However, Tony does aggressively push the Alphans, especially Helena Russell, to embrace, let's say, the philosophy of "extreme possibilities" and not cling to earthbound belief systems. "I want you all to throw out the criteria by which you judge what's real....You must believe!" He insists, when faced with disbelievers. At the end of the story, Koenig, Victor and Helena flee the spaceship graveyard (and the dead monster), essentially converted to Cellini's way of thinking. They have witnessed the impossible with their own eyes: a mesmeric alien creature which does not register on their instruments, and which devours human life forms. Helena brings up the example of Saint George and the Dragon, and suggests that Tony and the Monster will be a part of the new Alphan society's long-term mythology. 9. The Picture of Dorian Gray: "The Exiles"
Oscar Wilde's 1890 novel, The Picture of Dorian Gray involved a handsome young man, Dorian Gray, who was beautiful, immoral and also a criminal. While he undertook his reign of terror, Gray's portrait -- in secret -- became aged and horrible, reflecting his morality, his vanity, and his sins. As for Gray, he himself showed no physical or biological signs of his perversions and presented the appearance of remaining forever young. In the second season Space: 1999 episode, "The Exiles," Moonbase Alpha encounters two apparently benign alien teenagers, Cantar (Peter Duncan) and Zova (Stacy Dorning). In fact, these innocent-seeming (and physically beautiful) youngsters are alien insurrectionists. They are centuries-old, but protected by a physical membrane that prevent physical degeneration and aging. At story's end, Helena scratches Cantar's protective membrane, and, like Dorian Gray in Wilde's novel, the weight of the decades lands upon the vain villain in seconds: he super-ages and dies in horrible, gruesome fashion. 10. The Zombie: "All That Glisters "
Before George Romero's stellar re-interpretation of the Zombie mythology in Night of the Living Dead (1968), zombies were often simply mindless human beings; laborers working at the behest of an evil master. They were, in essence, unthinking henchmen in the White Zombie (1932) sense. 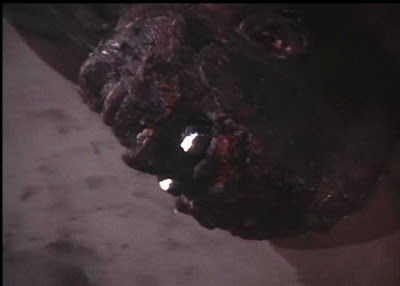 Space:1999's episode "All That Glisters" resurrects this older interpretation of the zombie on a distant planet inhabited by sentient, silicon life-forms. These alien rocks murder Security Chief (Tony Verdeschi) and then re-animate him as a zombie, essentially, to serve as their arms and legs. The horror-overtones of this episode are also quite dramatic. Director Ray Austin deploys some tight-framing, dark-lighting and claustrophobic settings to express the horror of the situation. Other episodes of Space: 1999 also dealt explicitly in horror tropes. "Mission of the Darians" concerned the taboo of cannibalism (a concept we see in literature such as 20,000 Leagues Under the Sea). "Brian the Brain" was a Frankenstein story, with a renegade, technological monster (a murderous robot) murdering his creator/father, Captain Michael (Bernard Cribbins). "Seed of Destruction" was a variation of H.P. Lovecraft's "The Case of Charles Dexter Ward" only with Koenig confronting an alien doppelganger, rather than a wizardly ancestor of identical physical characteristics. "Death's Other Dominion also involved scientific hubris and super-aging in its unforgettable climax, and "The Testament of Arkadia" highlighted a valley of death - a necropolis of sorts -- on an alien world, as well as ghostly force influencing the Alphans. Of course, a relevant question is this: why create a technology-based, outer space series utilizing so many instances of horror in mythology, literature and even the movies. The answer lies in Penfold's and Byrne's unique concept of the series. Specifically, Johnny Byrne once informed me that Space: 1999 "is a modern day (near future) origin story of a people. The Celts, the Aztecs and the Hebrews all have origin stories. But Space: 1999 took place in real time, not pre-history. It was a futuristic rendering of that old story: of people cast out from their home with no plan, no direction, and no control. There are elements of faith, magic and religion in the series, and nobody seems to understand and accept that. In Space: 1999, we are witnessing the foundation of a culture." Now imagine that culture established, some two hundred years after the events of Space: 1999. The stories those "future" citizens might tell would involve terrifying tales of their founding: of the premature burial, of the encounter with sirens, of St. George and the Dragon, and so forth. If you're interested in learning more about Space:1999's futuristic "origin myth," don't forget to check out my critically-acclaimed book, Exploring Space:1999, now available on Kindle. Great post, John. 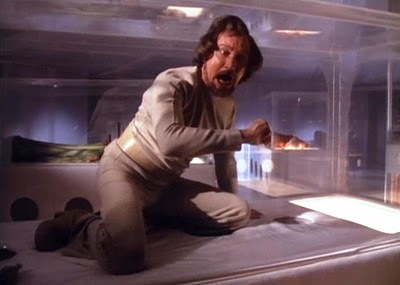 I caught only a few of these episodes, but you are quite right about the horror aspect that characterized SPACE: 1999. Being that The Odyssey and the character of Odysseus is one of my all-time favorite stories from my youth, I need to catch 'The Guardian of Piri'. Many thanks. Brilliant analysis of SPACE:1999. I have been a fan of this series ever since I saw it debut in September 1975 as an 11 y.o. boy. I purchased your book EXPLORING SPACE:1999 over a decade ago and must praise that too. Thank you anonymous, glad you enjoyed it. SGB: Thank you for your kind words about my post, and also about my first book, Exploring Space:1999. That book is like a child to me, so I always love to hear that people enjoyed it. I also watched Space:1999 on its first run...and I've never been the same. I always love to champion the show, and introduce it to new audiences too. All my best to all! 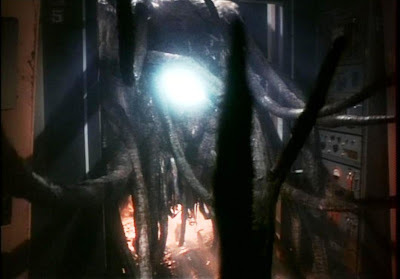 Loved the HP Lovecraft/cosmic horror feel to Space 1999. Makes sense. Why wouldn't there be a lot of horror in the biggest, most dangerous environment known?